R.I.P., Michael Brecker. 11 years ago he left this world. Click the image for more of his music. The world lost a genius musician when Michael Brecker passed on. He has been sorely missed. While performing at the Mount Fuji Jazz Festival in 2004, Brecker experienced a sharp pain in his back. Shortly thereafter in 2005, he was diagnosed with the blood disorder myelodysplastic syndrome (MDS). Despite a widely publicized worldwide search, Brecker was unable to find a matching stem cell donor. In late 2005, he was the recipient of an experimental partial matching stem cell transplant. By late 2006, he appeared to be recovering, but the treatment proved not to be a cure. He made his final public performance on June 23, 2006, playing with Hancock at Carnegie Hall. Brecker died from complications of leukemia in New York City. His funeral was held on January 15, 2007 in Hastings-on-Hudson, New York. Brecker would be 68 if he were alive today. For many hard-core jazz enthusiasts, it was his work of the early 80s — on Steps Ahead’s first two albums, when the band was simply called Steps — as well as Chick Corea’s “Three Quartets,” from 1981, and Pat Metheny’s “80/81,” from 1980, that cemented his reputation as a great player. Brecker is often considered one of the great interpreters of John Coltrane’s music. In 2001, he participated in a tour with Herbie Hancock and Roy Hargrove, honoring the 75th anniversary of the births of Mr. Coltrane and Miles Davis. Prior to his brilliant ’80s output, Mr. Brecker played on over 900 albums, including started in 1969, playing on the record “Score,” with a band led by his brother, the trumpeter Randy Brecker. He went on to play sessions for a huge roster of artists that include Chick Corea, Pat Metheny, Frank Zappa, Aerosmith, James Brown, Paul Simon, Joni Mitchell, Lou Reed, Funkadelic, Steely Dan, John Lennon, Elton John, and James Taylor, Gonzalo Rubalcaba, and Papo Vasquez. His inclusion in the Joni Mitchell tour with Metheny, Jaco Pastorius, Lyle Mays, and Don Alias yielded a critically acclaimed event and recording. More so than most saxophonists, Mr. Brecker’s strong tone and idea-filled music have always invited comparison with Coltrane’s, although Mr. Brecker is too modest to agree with this assertion. He does concede, however, that Nearness of You was greatly influenced by Mr. Coltrane’s 1961 recording, Ballads. Mike and Randy Brecker’s work with Mike Mainieri’s Steps Ahead group is legendary, starting off in the brothers’ jazz club in New York City Seventh Avenue South. 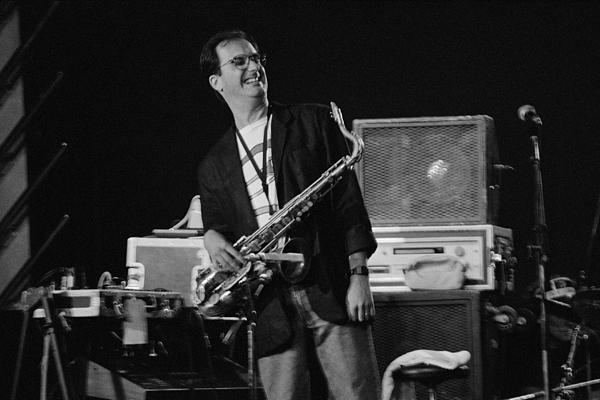 Michael Brecker has been a far bigger influence on the music we all know and love than most of us may ever know. Take a day to look into this musical genius. This entry was posted in Jazz innovation, Music News by Mike Crutcher. Bookmark the permalink.